Why gendered approaches to peace and security are now more important than ever. October 31, 2017 is the 17th anniversary of UN Security Council Resolution 1325, the most translated resolution to date. This resolution marks the first time the Security Council recognized that men and women experience conflict differently, and that women play an integral role in conflict prevention, resolution, and recovery. 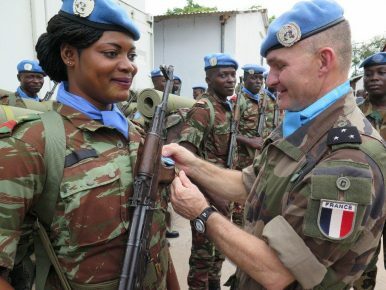 It urged international actors to increase women’s participation in peace and security processes and incorporate gender perspectives into all post-conflict efforts, signifying a historic policy shift and the unofficial rallying cry of what is known as the Women, Peace, and Security (WPS) agenda. Over the last 17 years, the WPS agenda developed into a comprehensive normative framework, backed up by seven subsequent UNSCRs. As of September 2017, 69 countries adopted National Action Plans (NAPs) for implementing 1325 (though it is worth noting that only 13 of those have budgets). Yet, and in spite of much lofty political rhetoric, the WPS agenda is one of the most structurally underfunded and under-implemented agendas of the Security Council. According to the Organization for Economic Cooperation and Development’s Development Assistance Committee (OECD DAC), only two percent of global peace and security funding targeted gender equality as its primary objective – $439 million out of a total of $10 billion (2012-2013). Regarding women’s participation in peace processes, only two percent of chief mediators and nine percent of negotiators were women, for the period of 1992-2011. While Jean’s question was rhetorical, its response is worth explicating. Conversations around disappointing implementation too often halt after listing insufficient political will and funding, which does not illuminate the underlying factors that must be addressed, such as deep-rooted norms, structures, and value systems that privilege masculinities over femininities. Underpinning the failure to translate declared support for the WPS agenda into changes in the lived experiences of women and men, boys and girls in conflict-affected areas is the common – but not universally held – fallacy that the agenda is limited to women. Despite its title, WPS is not strictly about adding women to peace and security issues. At its core, the agenda sees conflict through the lens of power relations, the result of gender norms and institutions that underpin violence and militarism. It calls on actors to address the root causes and drivers of conflict, gender inequality among them. In that sense, it is much more than a women’s agenda; with implications for economic development, governance and other areas, it is more than a peace and security agenda. The dichotomy between women and gender is not just a matter of semantics. When the focus is on women rather than power dynamics, WPS issues can be construed as peripheral, something to focus on once the “important” and “urgent” work is complete (which it never is). Policy discussions become preoccupied with aspects of the agenda that have to do with women’s physical bodies, such as sexual violence, while overlooking aspects such as livelihoods programs for female ex-combatants. Evidence of both sidelining and relegating the agenda is rife. Most recently, in the midst of the UN’s current reform process, MINUSCA recently downgraded its senior gender adviser to a much more junior role (from P5 to P3). When the focus shifts from women to gender however, gender analysis is a critical tool, rather than an elective; women are transformed from instrumental missed opportunities to agents of change. Using the gender analytical frameworks proposed by the WPS agenda is intellectually strenuous, time consuming, and, to many, it is more threatening than an “add women and stir” approach. Gender, peace, and security (GPS) requires long-term commitment, leadership, and predictable funding – a policy trifecta that is intimidating to government actors. The gap between rhetorical and financial support will prevail unless and until the perceived costs of action outweigh the costs of inaction. This is an area where civil society must continue to be a centrifugal force, demanding governments live up to their commitments. Budgeted NAPs with strong monitoring frameworks are just one accountability measure. Civil society can also remind decision makers of the costs of the status quo: the total global cost of violence and conflict in 2015 was a staggering $13.6 trillion – more than five times the GDP of the U.K.
As the UN undergoes a major reform process, the time is ripe to highlight the business case for gender, in addition to rights-based arguments. The Sustaining Peace agenda offers an opportune entry point to do so, given the focus on conflict prevention, its intimate links to the WPS agenda, and the cost-effectiveness of both. Champions such as Sweden and Canada should continue to trail blaze, piloting innovative programs to identify what is most effective in which contexts and making it easier for others to follow in their footsteps. The Colombian peace agreement, which contains over 100 gender-specific provisions, also offers some best practices for others to follow. Innovative funding mechanisms that include women’s civil society organization in decision making, such as the Women’s Peace and Humanitarian Fund (WPHF), should be strengthened. A fundamental misreading of the WPS agenda thwarts its transformative potential. WPS advocates and supporters must challenge it through their actions, not their words. A recipient of WPFH funding, Goretti Ndacayisaba, the Executive Director of Dushirehamwe Association in Burundi, recently compared her work to a wooden bridge, warning that without reinforcement, it will not last forever. Jessica Zimerman is a gender and peacebuilding expert and consultant.